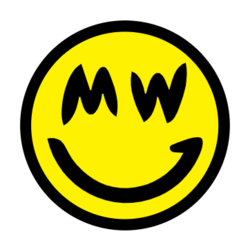 What does pop art, cryptocurrency and remittances have in common? Luis Buenaventura, founder of Bloom Technologies, speaker, author, artist and tech contributor first dabbled in the art scene when he worked as a New Media Designer back in early 2000. Although he majored in Art, he had a love for maths and computer programming. He was always curious and attracted by the way how art was able to convey complex theories into a form of expression. The Internet was booming in the Philippines at the time. While his peers were busy partying, he would quietly teach himself how to code and build websites. He would hawk his services in online forums to supplement his income. Even then, he already knew the Internet would be big and with it comes opportunities. It was these skills which he had honed during his university days, that would eventually led him to leave his job to found his own startup. However, the early days as a startup founder was no bed of roses. It was rocky as most of his customers had difficulty paying him for his services simply because most do not have any credit cards. To make matters worsts, 70% of the country’s population do not even own a bank account. While he was searching for a solution to overcome this problem, he stumbled upon Bitcoin and the potential of the remittance industry. “During the initial years, it was tough. As I learned more and more about Bitcoin, that was how I dig deep into the remittance industry”. He eventually pivoted his business to what is known as Bloom Technologies today. 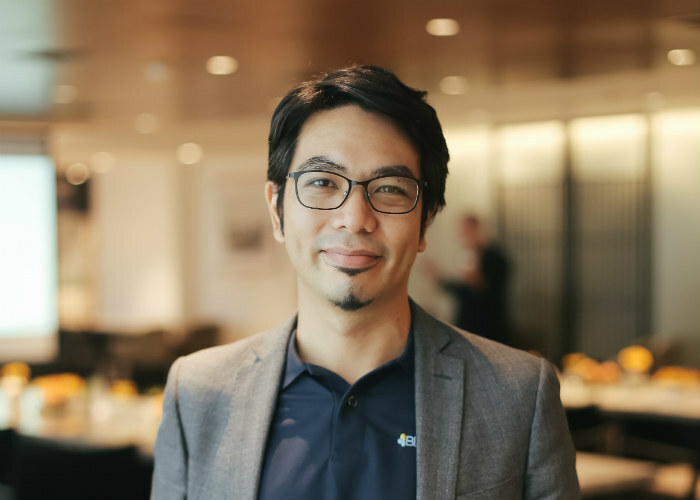 Bloom was started together with his co-founder, Israel Keys in 2015 to assist migrant workers and refugees to remit their money back to Philippines faster and cheaper by almost 50%. To date, the company has moved close to USD150 million across the platform. Bloom employs a business to business (B2B) model and deals directly with the remittances and money changers. “It is much easier to convince the remittances than direct customers of our services. We talk to owners of remittance businesses and give them the software to convert it into Bitcoin. It then gets forwarded into pesos, before it is forwarded to the final receiver”. Buenaventura believes the current B2B approach is a feasible model, as the remittance businesses are the ones who will service the public at large. To make Bloom’s solution more accessible to the masses, the company works hand in hand with a network of 18,000 pawn shops spread across the country to receive money. All they had to do was to wait for an SMS notification on their mobile phones to inform them of the incoming funds and head to the nearest pawn shop to collect their cash. No questions asked. It is definitely a game changer considering there are 10 million Filipinos working abroad and they sent a cumulative of USD30 billion dollars in remittance alone. Each of them pays an average of 7% in fees. Looking at the staggering numbers, Buenaventura, has made it his personal mission to improve the existing money services such as foreign exchanges, microlending services and remittances through Bloom Technologies. Bloom currently has presence in Hong Kong, South Korea, Australia and Singapore with Hong Kong recording the highest volume of transactions. “Our biggest challenge is scalability. Every country connects to different brokerages and exchanges. And with it comes a whole new set of banking rules and regulations”. With Bloom entering its fourth year of operations, what does this busy entrepreneur who is also a tech columnist for two online publications do to unwind? “I really like doing it and it is a great stress reliever. I like it when people are entertained by my art”, Buenaventura enthused. Towards the end of 2016, Bitcoin started to gain a lot of interest worldwide which caused the prices to soar. Riding on the wave of interests, Buenaventura decided to produce quick 5-minute doodles to record the latest Bitcoin prices and uploaded it to his Instagram. Little did he know the doodles would go viral and became more popular than he imagine. What he started for fun, slowly became something more serious. He decided to sketch and draw on his iPad and the response hit the roof. To add a little spice and flavour to his doodles, he would research on the popular and trending movies, the main characters and blend it into his doodles. At the time, Game of Thrones, Avengers and Star Wars was all the rage and he managed to tap into a bigger fan base as a result. Unfortunately, Bitcoin prices started to hit an all-time high of USD20,000 and it shot up faster than he could doodle. By then, he had spent a significant amount of time to produce his doodles and he was having a hard time to keep up. He realised then, he needed to shift his focus to something timeless – the people and the crypto community which were far more valuable and important than the Bitcoin prices. He wanted to lend an air of sophistication to the industry and applied art into something which the average Joe could relate to. Buenaventura decided to switch gears and work on portraits instead. Hence the birth of Cryptopop in February 2017. 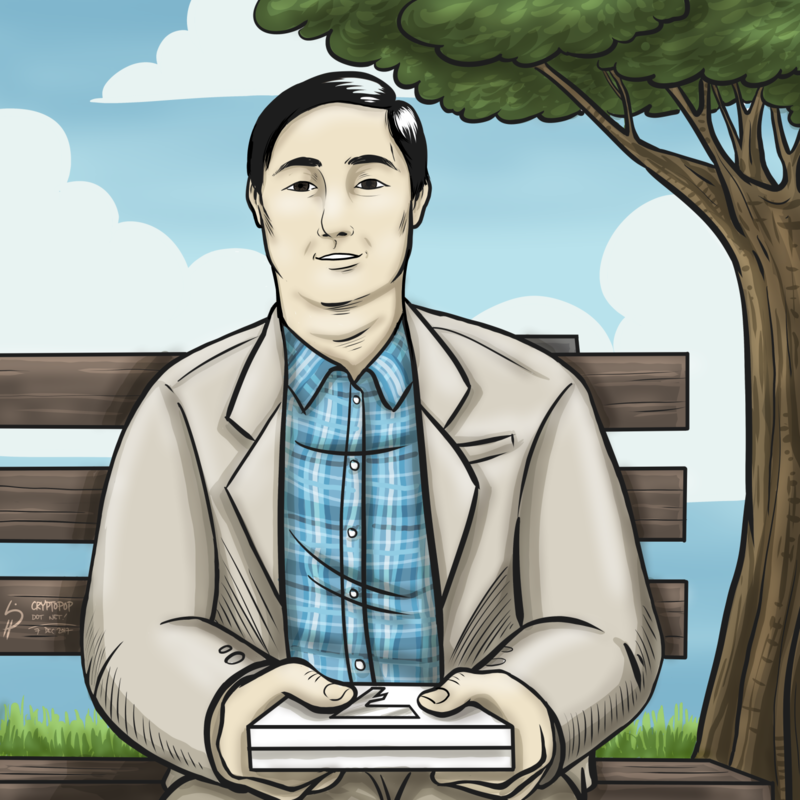 Many interesting personalities and faces in the crypto space have been featured ever since including Charlie Lee, the founder of Litecoin. 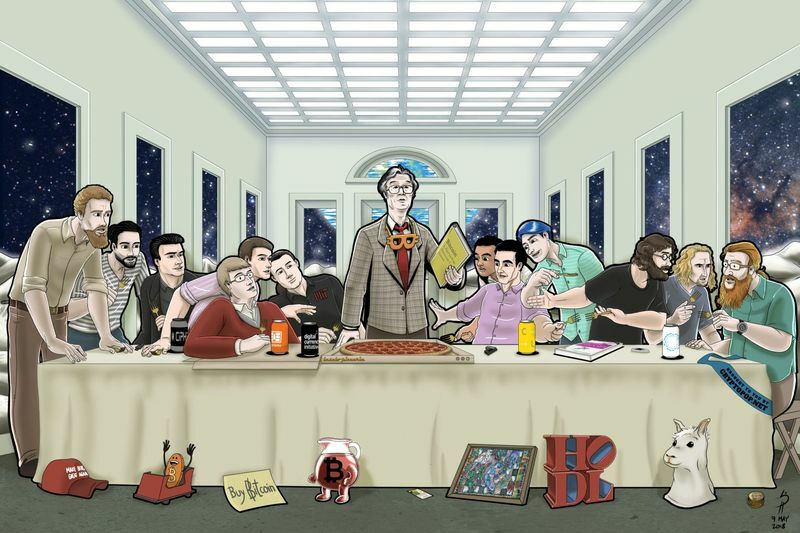 Supper at The Bitcoin Moonbase which was inspired by Leonardo Da Vinci’s original painting of The Last Supper was also a hit among the crypto fraternity. That particular art piece took Buenaventura over a month to complete before he was satisfied with the outcome. He confessed what interests him most was his subject, the people and the myriad of reactions that he received from people of all walks of life who never failed to amuse him. But how does this busy entrepreneur find time in his packed schedule to doodle? “Most of my art pieces were produced on airplanes and in between travelling from one country to another. Whenever I have a free evening or weekend, I will work on my portraits”, replied the hardworking Buenaventura. All his art pieces were done on SurfacePro and produced in digital format. He also uses Clip Studio which is very popular among Japanese manga artist to complete his art pieces. It usually takes him 3 days to a week to complete an art piece depending on the complexity of the pieces. Last year alone, he had completed about 50 pieces while jetting around the world on business trips and speaking engagements. Apart from producing art pieces for Cryptopop, he also does commissioned work for individuals or organisations who appreciate his art. 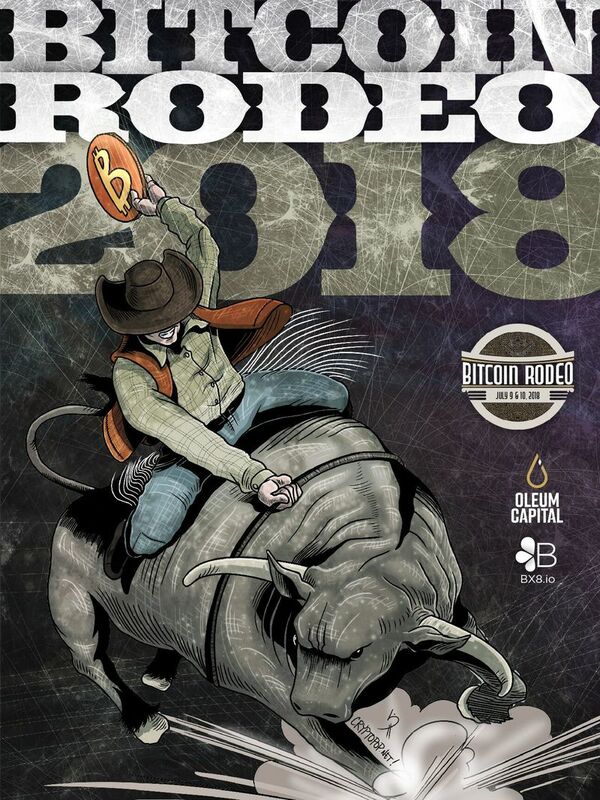 “I do commissioned work like the one I did for Bitcoin Rodeo which was featured on the Bitcoin beer bottle. I am happy to do the same for startups too”, proclaimed Buenaventura. He added, “I generally spend time talking to the person before I start, as I want to understand them a little bit more”. “Develop your own unique style. You only have to remain popular among the small crowd of people who is fervently loyal to that particular niche. And be consistent so others are able to identify your style and most of all, be patient”. His current mission is to help South East Asian migrants to remit their funds safely and securely without having to pay exorbitant fees for it. As this problem is too huge for a startup to solve, he decided to author Reinventing Remittances with Bitcoin, a book documenting his personal journey to inspire other entrepreneurs to create solutions to collectively solve the problem. “My hope is to give entrepreneurs a recipe on how to do this and maybe they will come out with a recipe of their own for their own country. Of course, we are also happy to partner with other startups who wants to do this in their home country too”. Four years on, Buenaventura has come a long way from the early days of Bloom Solutions where it struggled even to secure a meeting with the authorities. “Now it is much easier, as the authorities are aware there is a crypto solution now in the space. They are also more open to consultations compared to previously. We are proud to say we have successfully position ourselves as the chief proponent of the industry”, said Buenaventura. Although the battle is far from over, Buenaventura recognised that it is very much a work in progress. “Change doesn’t happen as quickly as it seems, especially in the financial sector which is a heavily regulated industry. But as the years go by, everything slowly becomes clearer and clearer”, he remarked. One of the proudest moments for Bloom Technologies so far was nailing a coveted spot in Google’s Launchpad Accelerator programme for six months to visit Mountain View, California. Not only were they given a tour or Silicon Valley, but they also received a small grant to work on as well as tons of operational support. The programme opened the door for them to access a pool of advisors and mentors. Apart from that, Buenaventura is also proud to witness Bloom charting a significant remittance volume and branching out to many countries. 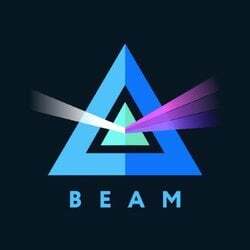 Moving forward, he aims to introduce Bloom Technologies into multiple markets to reach the 650 million population in South East Asia. To achieve this, Bloom Technologies has launched the private sale of Bloom X (BX8) until 27th July.